Purple corn is a variety of corn which has a blue colored kernel. If you are wondering about how the maize gets the blue color, then it is because of the polyphenols called as anthocyanins. But, in case you take the plant to another country other than Peru, then the kernel is bound to lose its color. 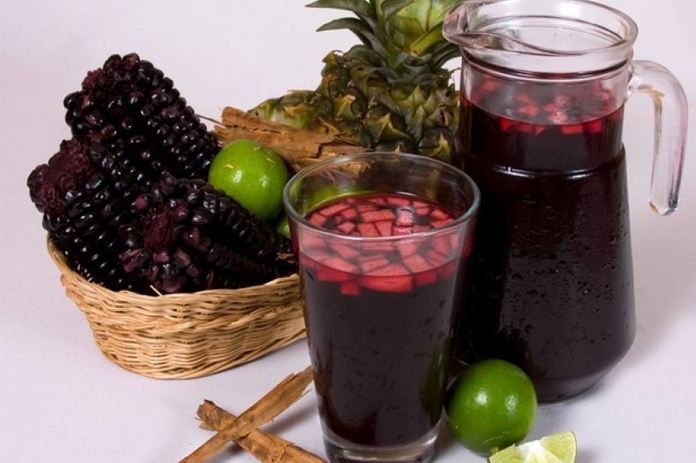 So, before we check out the steps of preparing Chicha Morada juice, let’s have a look at the health benefits the corn offers. Even though you might hesitate to eat purple corn, the maize actually offers plenty of health benefits. Due to the presence of anthocyanins, purple corn is considered to be a solution for many ailments. Such type of antioxidant possesses anti-inflammatory properties and is capable of fighting free radicals. In case the individual is having corn regularly, then the maize can certainly help to develop resistance to cancer. It’s actually beneficial to eat purple corn if the person is having diabetes. While the anthocyanin makes the glandular system strong, it also boosts the functionality of pancreas. This, in turn, helps to enhance the secretion of insulin which is responsible for regulating the blood sugar level. High blood pressure can always be the root cause for memory loss, kidney damage and many cardiovascular diseases. But, things start becoming normal once the blood pressure is controlled. So, to observe the difference, doctors may recommend eating purple corn. This lowers the blood pressure apart from helping the body to maintain it at an optimal level. The effects of the anthocyanin have always helped to prevent cancer. Apart from improving the condition, the purple corn can serve to be the best solution for benign and malignant tumors. Individuals can always keep their worries away especially when they are suffering from colorectal cancer. According to a study, purple corn can be thought of as an incredible weight loss supplement. Even if the individual tends to overeat, the anthocyanin CG3 present in the extract aids to combat obesity and thereby maintain weight. The phytonutrients that are present in purple corn boost the energy level and help in protecting the cells. As the maize affects the entire body, it keeps the organs and tissues healthy. Moreover, it also protects the DNA against a serious damage. Due to the anti-oxidative properties, purple corn is certainly good for the kidneys. The maize keeps the person away from kidney stones and prevents the hardening of blood vessels. Even if the kidneys have failed to perform its role, regular consumption of the juice can aid to improve the condition drastically. Among the antioxidants in purple corn, lutein and zeaxanthin always contribute to the overall health of the eyes. Besides, the corn can keep the person away from eye ailments like macular degeneration, cataract and many more. A purple corn supplement is always recommended when the skin becomes dry and wrinkles start appearing. This is owing to the presence of lutein which aids in maintaining skin health and helps to restore the smoothness and the luster. How to make Chicha morada at home? Well, it’s pretty easy and simple to prepare chichi morada. The refreshing drink gets its color from dried purple corn. It can be considered as a mocktail when it’s garnished with small pieces of pineapple and seasoned with cloves and cinnamon. The total time required to make the chichi morada is around 2 hours. But, the time may vary depending on how long you would be boiling the corn. Step 1: Initially, you need to take a large pan and mix chunks of pineapple, cinnamon sticks, sugar, cloves, sliced apple and 14 cups of water. Step 2: Asyou cover the pan, you should boil the ingredients at a high intensity flame. Later, you need to reduce the intensity till the corn becomes soft and the liquid content gets reduced. Step 3: Now, you need to discard the solid part using a spoon. You then have to strain the liquid with a fine mesh strainer into a large bowl. Step 4: Soon after 45 minutes have passed by, you need to add lemon juice and salt for enhancing the taste. Step 5: Moving ahead, you need to keep the juice inside the refrigerator for around 2 hours. Step 6: Now, you need to take a big jar, add sliced apple and pineapple and then pour the juice till the glass is full. Step 7: In the end, you need to serve the juice with ice and garnish with lemon slices. NOTE: There’s nothing wrong if you keep the juice inside the refrigerator for as much as four days. Usually, you can serve around four glasses if you have prepared a jar of the juice. Finally, there’s hardly any difference between other healthy drinks and purple corn juice. You can always bid farewell to your worries because the juice is rich in nutrients and has the capability of boosting the immune system. However, you must avoid drinking the juice only when you feel uneasy or when you observe an allergic reaction.